Here is a versatile recipe that can be served hot or cold, as an entrée or a side dish. In a 12 inch nonstick frying pan, heat the oil over low heat. Add the garlic and cook, stirring occasionally, for 3-4 minutes or until lightly coloured and fragrant. 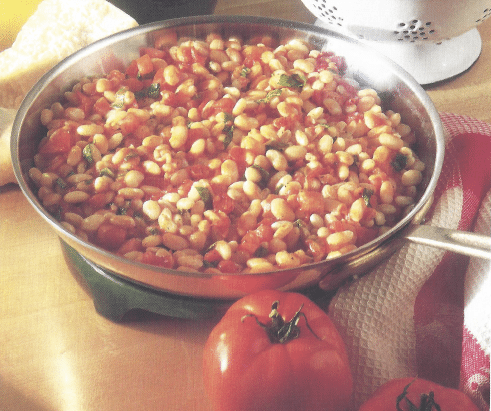 Stir in the beans, tomato and chopped basil and cook for 7 minutes or until heated through and the tomato has released its juices. Stir in cheese and lemon juice. Serve hot or at room temperature. (Will keep, refrigerated, for 2 days.) Garnish with basil leaves, if desired. Serves 4.